It’s hard to believe that the month of Ramadan is upon us and we are in the midst of its final days. Yes, before we know it, this beloved month will be over. But even so, this holy time of year brings with it an experience unlike no other. For Muslims all over the world, Ramadan marks a moment where worldly pleasures are subtracted, and spirituality is multiplied. You can feel this purity as family members, friends, and loved ones share blessings and warm gatherings; Facebook pages and WhatsApp groups become a hotbed for inspiring quotes, heart-eye emojis , and du’aas . The spirit of Ramadan also touches our food pantries. Suddenly, our kitchens transforms into utopias filled with snacks, spices, and drinks that will soon be devoured by friends and family coming together for iftar (the meal to break fast). But the focus of Ramadan is not just about food, or lack of it. We’ve said it before and we’ll say it again: the essence of this holy month centers on rebuilding and working on a connection with Allah (God). Nights spent praying at the mosque lift spirits high as beautiful words from the holy Qur’an fill our ears and touch our hearts. 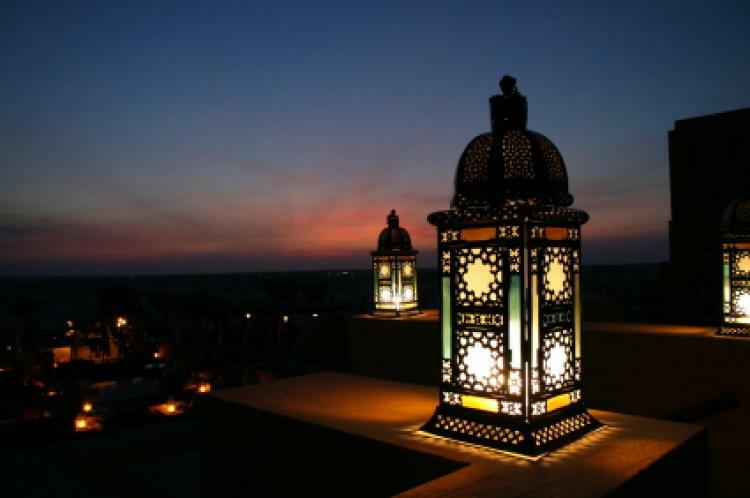 The beauty that is Ramadan, unfortunately, is met with a set of challenges that are often hard to overcome. There are of course the obvious hardships of abstaining from food and water from dawn to dusk. But, there are also those hurdles that life throws at you, leaving you with only two options: trip or jump. For Muslims living in the West, especially in America, jumping and tip-toeing around lunch invitations and seemingly never-ending annoying questions are woven into the fabric of the Ramadan experience. Every year around this time, the internet’s new buzz word is Ramadan. Articles explain, again and again, why Muslims fast during this holy month. Thankfully, the sounds of grumbling bellies provide great coverage to all this noise. If the external questioning and probing is not enough, Ramadan also invites well-wishers who may not have the best intentions. Come the first day of Ramadan and your phone notifications are on fire , but you notice that your ex-best friend or your ex-boyfriend have sent you a “Happy Ramadan” message. Surely, Allah is already testing your patience and generosity. But do not fret, because there is a wonderful meal waiting to reward you for all the drama you gracefully maneuvered. Unfortunately, though, not everyone during this month has the means to provide a meal at the end of their fast. For underprivileged Muslims all over the world, fasting for Ramadan is not far off from how they live year-round. Truly, this is by far is the saddest of all the hardships that Muslim face during this holy month. The disheartening challenges that accompany the month of Ramadan, though, should not define this holy time as we reflect on its passing days. But, they should also not be ignored as if they have no affect on the lives of Muslims everywhere. As much as we would like to side step all of life’s troubles and only live in blissful spiritual moments, the pillar of being Muslim holds us accountable for all aspects of life. That being said, the key to bridging the gap between the beauty and hardships of Ramadan, even after the month is over, is to find a balance and finish this month with a sense of generosity, understanding, and inclusivity. Such nice words, right? Well, rose-colored, hopeful intentions must be joined with action. Perhaps, your well-intentioned, yet slightly annoying co-worker genuinely admires the act of fasting and wants to know how you have such strength. Certainly, admiration never hurt anyone, so a conversation could be worth having. And maybe, just maybe, the ex’s in your life come back around this time of year hoping for a chance to right their wrongs, so (maybe) risk opening that door again and let Allah guide the way from there. As for the hardest of all truths to face, providing for those in need brings together all that Ramadan stands for. The bountiful snacks, spices, and drinks that welcomed their way into our full kitchens can certainly be matched in quantity and quality. Balancing the food, we give to our own with what we give to others has the power to change lives. As you look back on this Ramadan, you’ll probably feel a sense of regret for all the missed religious opportunities, not spending more time with your family, sleeping in so many mornings, missing qiyam or taraweeh prayers. But that’s normal. Let yourself feel those things, write them down, save them for next year inshallah. So, Ramadan, we say bye to you this time around with warm love and in the hopes that we will see you again soon; and we take all the good that has come during this holy month and try to implement it for the rest of the year.